I must preface this entry by stating I have always been a skeptic of the paranormal. Last week a friend and I decided to camp right by this old broken abandoned bus in Brian Head because it was getting late, and we were almost out of gas. It was the first place we could find to pull off and set up a tent. 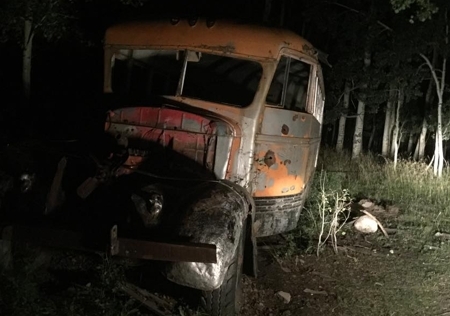 While scouting out the cool creepy old bus and gathering firewood, my friend said she had a really bad feeling and felt like we weren't welcome. As a skeptic, but a wannabe believer, I trusted her intuition, and we sat in the car for about half an hour, deciding what to do. Eventually, I convinced her that we would build a big fire and scare off anything that wanted to mess with us. As she was setting up the fire pit, I decided to be the spooky prankster that I am and snuck off into the shadows and stood silently. She called out to me several times, saying I was scaring her, and I just remained silent, giggling inside. But then, I heard a freaky growling sound near me and quickly ran back to the fire pit and got that fire started STAT! I easily dismissed the growling as some kind of animal, though I still cannot relate it to any animal sound I've ever heard. We proceeded to build a huge fire and cook dinner. My friend kept saying over and over she was hearing some ''unnatural'' noises. I got irritated and told her, ''look! We are in nature; therefore, whatever noises you're hearing are NATURAL!'' We argued about it quite some bit. Eventually, however, I heard IT. IT WAS UNNATURAL!! I said ''Get in the *!^&ing car--NOW!'' We were scared as hell! By now it was really late, and we had nowhere to go, but we felt safe enough in the locked car and decided to just sleep in there. Come morning, my friend was going through the photos and videos in her phone. She found a very strange unusual video that started with her voice but morphed out to a somewhat breezy silence. Then you can hear a bizarre guttural growling/gravelly sound several times over the 2:40 minute video. At about 2:12 seconds, 3 strange fire-like lights float across the otherwise black screen. Some say it looks like candles, which we did not have, and it definitely was not our fire. It is very peculiar and creepy. So we both have been tripping out on this freaky experience. I am much less a skeptic after what I heard in the woods and especially after what I heard and saw on that video. I told a friend at work about it, and he found this website. I am really, actually quite surprised there aren't any other experiences reported in this area. What other details are there about this place? You could email me @ miabs_11@ hotmail. com.